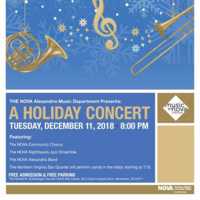 Come and celebrate the holiday season with the NOVA Alexandria Campus Music Dept. at our annual Holiday Concert. The Northern Virginia Sax Quartet will play carols fireside in the lobby starting at 7:15pm. The concert will begin at 8pm and end at about 9:45pm. We will perform many of your holiday favorites and there will be a singalong at the end. Admission and parking are FREE! Was my first time, and I intend to keep going back every year. Put me and my family in the Christmas spirit.